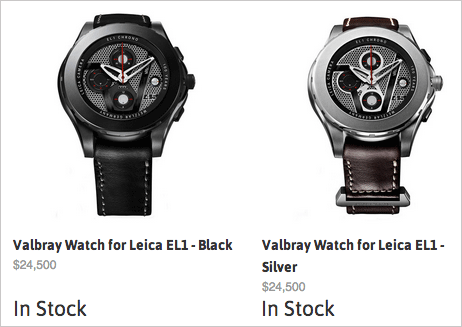 The Valbray EL1 watch for Leica that was announced few months ago is now shipping in the US and is currently in stock at the Leica Store Miami. Additional information on this limited edition watch can be found here. Leica Store Miami is currently offering free UPS 2nd day air shipping on all domestic orders $1,000 or more placed by December 22nd, 2014 and free UPS worldwide express shipping for all international orders over $3,000 until January 31st. 2015. This entry was posted in Other Leica Stuff and tagged Leica Limited Edition, Valbray. Bookmark the permalink. Trackbacks are closed, but you can post a comment.